I was at a Bulls game in 1998; my collegiate teammates and I were granted tickets by our university to a Milwaukee Bucks game versus the world champion Chicago Bulls with Michael Jordan and Scottie Pippen. The game was in Milwaukee. We were in town playing against the University of Wisconsin in Milwaukee and we were granted this special treat. 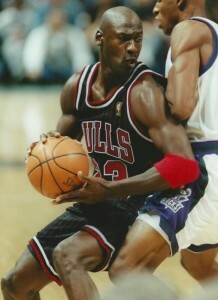 I remember this being my first Bulls game ever and my only time witnessing Michael Jordan live. I wanted him to have one of those 50 point nights. Instead, Michael only finished with like 28 or so point (notice 28 is an “only” for Michael, but a career night for a typical player today). I wasn’t disappointed but I did want at least to have some of the magic from the man Michael Jordan. Towards the end of the game he goes baseline on Walter Ray Allen and dunks over Armon Gilliam. I felt like I was at a Michael Jackson concert, the electricity of seeing Michael do one of his signature dunks went through the Milwaukee city. A few plays later he gets the ball in the post and spins off of Walter Ray Allen and does his signature reverse layup and I went crazy again. I found this video online and of course had to share it because Walter Ray Allen was a rookie in the NBA and Jordan was in his last year. However, the age and brilliance of Michael was able to sustain the youth and power of Ray Allen. This is why the world is ran by the elders. The elders have the experience to counter the power, the enthusiasm and the strength of the youth. Is this a knock against the youth? This is a knock against nobody except for those who wish to work alone. We must work together, the aged and the youth to sustain this world. Now, enjoy the Michael Jordan classic video! BBallers, who was surprised at Ray Allen holding his own against MJ and the Bulls?